Do you have tons of ideas in your head that you know should be a book? Have you just not taken the step of writing them down? Are too many things keeping you from your goal of finishing your first book? Cynthia Bazin and Regan Black, with over 35 years of combined experience in their fields, have teamed up to provide you with the inspiration, focus, and strategy to get your ideas out of your head and onto the page. Regan, a USA Today Bestselling author, will help you write a strong draft using the tips and tricks she has learned through her years in the publishing industry. Cynthia, a premier mentor and motivator with a Masters in Counseling, will hold you accountable with laser-focused strategies and a no-excuses approach. With these two stand-out experts giving you healthy doses of support and motivation, there’s no way you could go wrong. 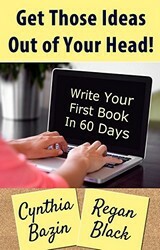 The only question left is this: Are you ready to write your first book? 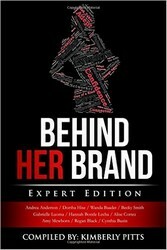 Behind Her Brand: Entrepreneur Edition Vol.3 takes you on journeys of real life lessons, obstacles, think tank processes, disappointments, and the victories of 12 successful female entrepreneurs who turned their brand into catalysts for their business successes. You will learn power moves on how to take your brand from zero to hero. Be prepared to be swept off your feet with their stories. Each author answered the following questions: * Tell us a little about yourself. We want to learn about the person behind the brand. * Share with us what your business is and why you wanted to start this business. * When did you know you were meant to launch your own business? * What has being in business for yourself done for you? * If someone asked you, who are your ideal clients, what would you say? * How do you measure success and what is your definition of success? * What was the biggest obstacle you’ve encountered since being in business? How did you overcome it? * What have you learned about yourself in running your business? * What was your most rewarding experience since starting your own business? * What 3 things do you now wish you would’ve known when you started? * How do you keep yourself motivated and encouraged when things don’t go right? * What’s your biggest business goal over the next 12 months and what will you do to meet it? * What advice would you give to a woman entrepreneur who is ready to take her business to the next level? * One of the biggest struggles women entrepreneurs have is how to price themselves. * What advice would you share about pricing your services and offerings? * What must have resources would you recommend to use in your business? * What makes you a Woman That Impacts? Energize Your Leadership springs from a collaboration of 16 leaders from around the world who came together online. They recognized a lack of energy, excitement and sense of purpose in the leaders they interact with each day. As they explored ways to help these disengaged, overwhelmed and discouraged leaders discover a new spark an extraordinary community of friends developed. Here they share stories from their individual journeys to demonstrate how energy ignites leadership success. Join us to energize your leadership – Discover, Ignite, Break Through. Energize Yourself Regardless of whichever philosophical or spiritual path you choose to follow, all of them have one factor in common – the root of all energy begins within, since the seed of all energy is found within ourselves. In this first part, we examine that seed by taking a look at four crucial energy centers found within ourselves and how best to tap them: Values, Gifts, Self-Questioning, Creativity. Energize Others Energizing others begins with the self. When you deeply know your values and gifts, the next step is bringing that true self outward – with authenticity and honesty. A foundation of authenticity brings life, vigor and genuine connection to personal and professional relationships. From there, you can meet the needs of others and motivate them to be active participants in the co-creative process. In this section, we look at four practices key to people-energizing: True to Oneself, Being Seen for What (and Who) You Are, Deal with Problem People, Serve to Lead – Lead to Serve. Energize Your Workplace An organization, like any collective of people, is not just the sum of its individuals but an entity unto itself. Together, these collected people form a singular organism with its own behavior and culture. We hope for one whose energy crackles with positivity and growth. Although all the insights in this book can be applied at the organization level, in this part we look at four factors that are especially crucial to an organization’s collective energy reserves: Brand “You”, Gut Thinking, Gratitude-Based Organizational Attitude, Love Multiples. Energize Your Future The future is often presented as some uncertain void of chaos and unpredictability, and while this is true to a large extent, such a representation also ignores the fact that we are each armed with those tools that can give us the best chance at success in the future. But how best to energize a future that holds so much unknown? Here are four concepts to do just that: Have a Plan B, Recognize the Role of Fun, Explore the Unknown, Face Whatever Comes with Positivity. Are you harnessing the power of collaboration with other women and the Law of Attraction to be your best, most empowered self? Dr. Shellie Hipsky captured the thoughts and life stories from the top 100 women on Empowering Women Radio in the Common Threads trilogy. Strategies for success can be found within these interviews with women from around the world who are manifesting lives they designed, often after experiencing hardship. Dr. Shellie Hipsky exemplifies the art of empowerment with points-of-view that span the globe from the United States to Africa and Asia. 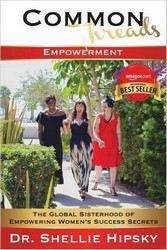 Empowerment is yours for the taking… go for it!